After a nudge from two city supervisors, Muni is looking to convert forward- and backward-facing seats to side-facing seats in its light-rail train cars as a way to squeeze in more passengers and speed up boarding. The SFMTA plans to run a trial starting in January by putting one reconfigured prototype car into service, which would be monitored over six months before reconfiguring other train cars. The pilot is moving forward at the behest of Supervisors Scott Wiener and London Breed, who called a hearing held yesterday on how the agency can increase capacity on its metro system while Muni riders await a new, larger train fleet due to arrive in 2017. By converting most seats to a sideways-facing orientation, planners estimate they could allow room for five to eight more passengers per train car while removing obstacles that can create bottlenecks when riders squeeze in and out at stops. Currently, 114 of Muni’s 151 train cars are in service, and most of the rest are in need of repair, according to agency staff. The Muni metro system lacks the number of train cars it needs to make all of its scheduled runs on half of service days. Among the laundry list of flaws with Muni’s current trains — manufactured by Breda, which has been disqualified from vying for the next production contract — is their unusually inefficient interior design, said Wiener. The expected capacity for Breda train cars is 218 people — 60 in seats, 158 standing. Seat reconfigurations would cost an estimated $20-30,000 per train car — “a relatively modest amount,” said Lee Saage, deputy director for capital projects for the SF County Transportation Authority. The project could be funded with revenue from the local Prop K transportation sales tax. One major challenge of the car reconfigurations, Saage said, would be designing the re-placement of grab bars attached to the seats and roof of the trains. John Haley, Muni’s transit director, said the two sandboxes located underneath on each train car (sand is dumped on tracks to help the trains brake) cannot be moved and may project out farther than the sideways-facing seats. 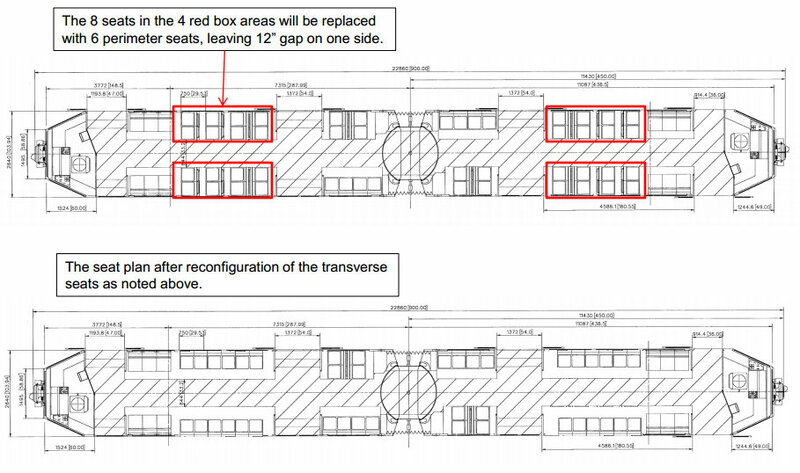 Under a reconfiguration design proposed by the supervisors, each of a car’s four sets of eight front- and back-facing seats would be replaced with six side-facing seats along the train’s wall, creating a 12-inch gap, according to diagrams presented by Haley. Altogether, eight seats per car would be removed, and allow for 16 more passengers. Muni anticipates a smaller increase of up to eight passengers, but Haley said the proposal needs more review. Haley said the prototype car launched in January would be one of two wrecked train cars which the agency is due to receive back in November after being reconstructed by Breda, and which haven’t had their seats re-installed yet. (Haley didn’t specify how the trains were wrecked, but they may have been involved in a metro crash that occurred in July 2009 at West Portal Station.) “These cars were essentially gutted and are being rebuilt,” he said. The SFMTA currently has no timeline for when re-configurations could be expanded beyond the one-car pilot. The agency is also testing other service changes in the metro to relieve crowding, such as running three-car trains within the underground system only, as well as double-train loading. Reconfiguring the seats isn’t a bad idea. Some of the seats on the train is horrible on our knees, such as the window seats that are right next to the mid doors. I wonder why Muni couldn’t have done this a long time ago when they first ordered these vehicles. You sure about that? The Metro control screen shows 31 cars in the tunnel right now. If there’s only 37 cars in service, that would leave only 6 running above ground. Woops, that was a typo. 114 cars are in service. Back to the future? I looked up the standard Muni cars from the pre-PCC days, built from 1912 to 1928, and they all had long benches in the center section. More to the topic, I like the proposal, provided it’s coupled with some sort of plan to “reconfigure” oblivious passengers with enormous backpacks that they refuse to put between their legs. What ever happened to double loading in the tunnels? The article you linked to said Muni was aiming for July. I also hope they are planning to add additional handholds and vertical grab bars, and also lower the topmost horizontal grab bar. When the train is crowded, I purposely avoid the center sections of the car because I cannot reach the horizontal bar and there is nothing else to hold onto. Why does altering the seat configuration cost $20-30k? Maybe MTA should outsource the work to BART workers who seemingly have to deal with seats on a much more frequent basis. I think it was supposed to happen after the upgraded automated train control system was installed (by the same vendor that installed the original faulty ATCS) in the tunnel. Maybe MTA is waiting until the new platform displays are up and running. Who knows what else is on MTA’s to-do list for subway capital projects. Will let you guys know when I get an update on that. I assumed the ATCS was delayed because it was set to be installed during a muni metro shutdown scheduled for early July, which the sfmta postponed by a week or so to offer relief during the BART strike. But that doesn’t explain this amount of a delay; very excited to hear the answer. So Supervisor’s Weiner’s plan is too CRAM MORE people on a car. How about increasing the number of cars? As a rider of 30 yrs tired of cording and bing bashed with foot-thicks backpacks wielded cluelessly, SINGLE SEATS would be the improvement. Strangers on MUNI and swapping DNA from pressing fleshy thighs is a CRAP riding experience. We PAY for MUNI with out money, so why the hell isnt the system designed for customer satisfaction? Alert readers may recall how MTA held a dog n pony show in CITY to “choose” new bus shelters. In fact, they had already chosen the design and the public relations was a sham. Make MTA management ride their own product – because theyre sure out of touch with daily drama of being a passenger in a too full sardine can. It’s worth a try, as is making space on LRVs to pilot space for bicycles, which has been talked about for about 10 years. People first, of course, especially during rush hours. But if other cities like NYC and Portland can have allow bikes on their LRVs or subway cars, at least for certain hours of the day, I think we can at least try it without the world ending. If bikes are not allowed during rush hour, the space will be there for people to stand. I don’t remember ever being on a streetcar thinking to myself “What this car needs is 5-8 more passengers”. Muni needs to get more cars out on the lines, and more operators who aren’t dangerously stupid to drive them. Getting more cars is easier said than done. Muni has a $2 billion+ State of Good Repaid backlog, which includes all the necessary bus and train repairs and more. They can’t afford to even pay for any new vehicles of any kind with their own money, so they have to rely on grants and sales tax money to order small amounts of vehicles each time ONLY when they are legally considered past their useful lifespan. So that’s why Muni will get a small amount of new LRVs around 2016-2017, and then they will start getting the rest of the fleet replaced at least after 2019. Someone needs to fix potholes if they expect people to stand on those buses safely, and make sure the buses take off and stop carefully, or you will have a lot of injuries. Pot holes don’t affect Muni Metro. I’m riding one of the modified trains right now. Who are the dumbasses that thought this was a good idea. All of the open space is now just unused space where no one stands or sits… Cause the bars to hold onto are still in the same place forcing the people who stand I the aisles still(now there more standees cause there are less seats as well. These transportation big shots should have taken an old packed train and put the same amount of people on these modified trains… I garentee the new trains would feel way more crowded cause no one can physically stand in the space that is now available from the removed seats. And the 8 people per car who used to have a seat are now 8 more people standing and blocking isles. Muni needs to evolve with the city… THIS IS NOT THE SOLUTION! Update in 2018 – tried riding one of the new sideseating cars and my neck, back and pelvis got injured by the sideways motion. There are not even any seats to cradle the body when riding sideways. I can’t ride sideways. Anyone else with physical health issues re riding sideways? We’ll be in discussion about getting some horizontal seats put back in.